Tattoos used to be something of a polarising issue, growing up my grandfather had a few faded ones from his days in the Navy and they always fascinated me. It was rare that you would see someone in the street with a tattoo unless they were a biker, a former guest of Her Majesty (a convict) or a member of the armed forces. Nowadays they are everywhere and it’s socially acceptable – footballers have full sleeves, Mike Tyson has his faced tattooed and the range of breadth of designs is mind-boggling. My parents being somewhat traditionalists were not in favour of me getting my body inked, but this didn’t stop me. 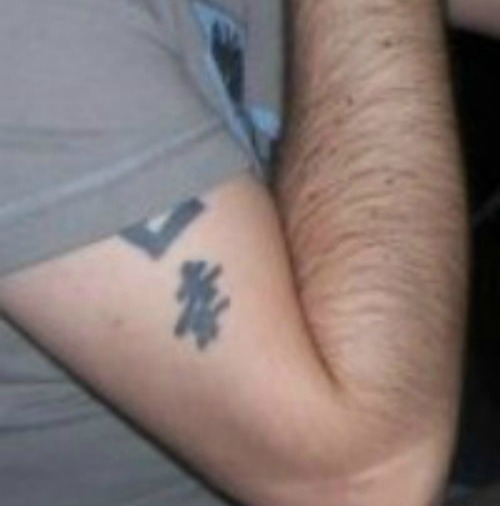 At the ripe old age of 18 and somewhat sickly I thought it would be a good idea to get an ironic inking – the result was the Japanese symbol for health on my right upper arm. A few years later I added another Japanese symbol, wealth. All was not well with the second tattoo, it became infected and the ink actually faded so that I was left with an unsightly scar. A very painful re-colouring followed. The picture below shows the final result of my youthful folly. Fast forward 18 years and I’d grown tired of the tattoos I had and gave serious consideration to finding a way of covering them with a new design. After seeing some really cool half and full sleeve tattoos I started badgering for one. 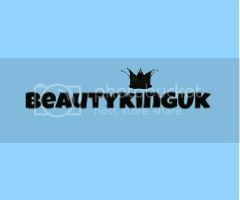 It took 12 months to finally work up the courage but I took the plunge at the start of 2014, and after speaking with friends and doing some research both Beautyqueenuk and I stepped into Southgate Ink, a small tattoo parlour based, yes you guessed it, in Southgate, North London. Stepping through the door my eyes were assaulted by an array of pictures, drawings and designs. You immediately enter into a small seating area/waiting room where you can browse until your heart is content – at the time there were a number of sketches on the wall that had been drawn by the two resident artists and wow, they were amazing. I’m not a big fan of hard sells and at Southgate Ink you don’t get this – the owner, a larger than life heavily tattooed Turkish guy leaves you to browse and consider your options. This I found refreshing. In my head I really wanted either a Maori or Aztec tribal design but after browsing the books couldn’t find something I wanted. After asking for advice I showed him my arm and he made a suggestion of a Japanese garden with Koi carp. The justification was that the rich colours in the design would act as a good cover-up for my existing tattoos. I explained what I was looking for and he suggested that one of the artists – Sonad, could draw up a design for me to review. I noted down the kind of tattoo I was looking for and what to include on a piece of paper to give Sonad an inkling of what to aim for. We then started to talk money. For an initial one off design and drawing the cost was £40. This is also their minimum price for any tattoo no matter how large or small. The price of the drawing is deducted from the cost of the first sitting, but at £100 per hour* a full sleeve design I had asked for was estimated at around £700-£800. Not bad I thought and money was exchanged. 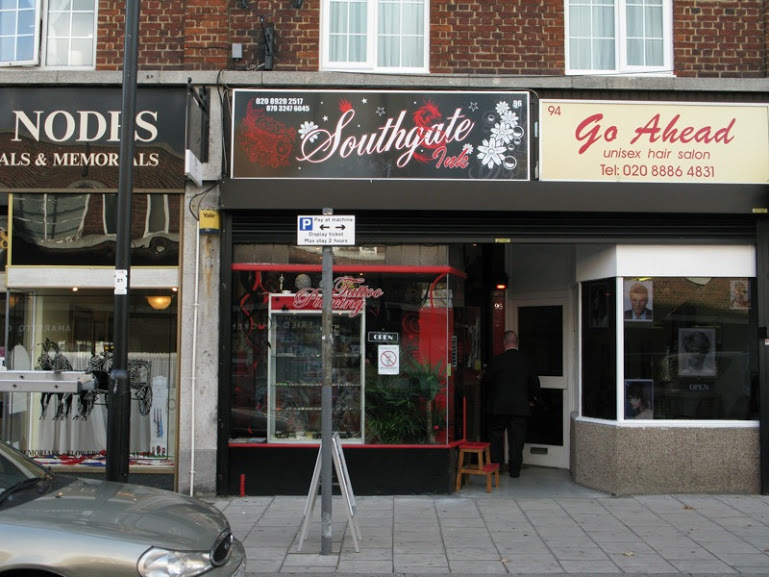 *As they have reached their fifth anniversary Southgate Ink have reduced their prices to £60 per hour, however its always best to get an estimate before starting any work. An outline of my arm was taken using a large sheet of tracing paper and my existing tattoos outlined. Given that the artists draw and tattoo I was advised to come back the following week. On my return I was presented with a full A3 sheet of paper – the sketch was out of this world. All of the artists at Southgate Ink are incredibly talented and to be honest I’m slightly jealous. 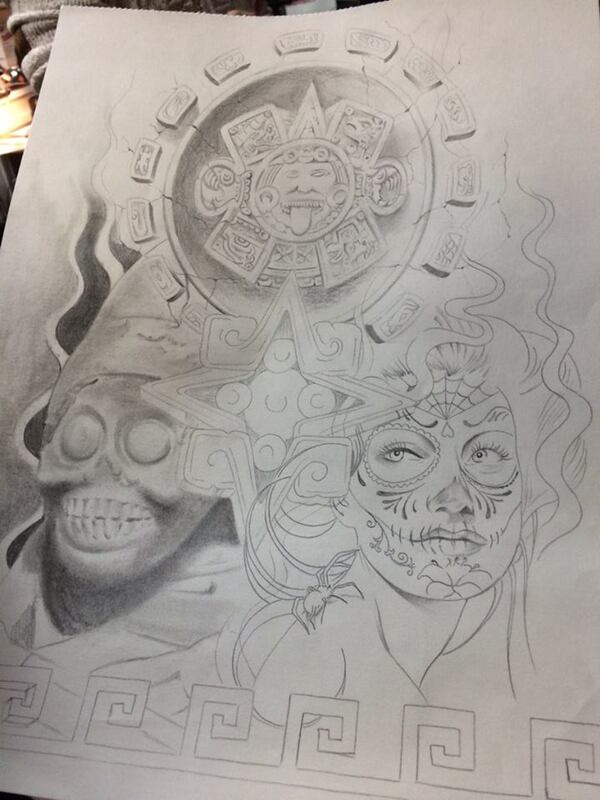 The only issue was that the drawing included three faces, a Mayan priest, a candy skull and a female priestess. I didn’t like the idea of having them tattooed onto my body. I could see the look of disappointment on the faces of the guys in the studio, but with some guidance (I showed them the Mayan calendar, a massive intricate piece of carved stone that was found in Mexico City) I was asked to come back and they promised to have another go. On my next visit I was even more amazed with the resulting sketch. The Mayan calendar, including the Mayan god of sacrifice had been added as had a rather sinister looking smiling face. I’ve included a picture of the sketch below. Being slightly OCD I still didn’t like the candy skull and asked for the sinister face to be mirrored onto the other side. Symmetry – ahhh that satisfied the OCD. Their response at the request? No problem at all, it’s your body and your choice. Nothing was too much trouble for the guys and they treated me to perfect customer service. This didn’t end there, throughout the entire experience, and I spent a lot of time in the studio they were kind, thoughtful and kept me well hydrated. The first sitting was to start the cover up and was for five hours – the photographs below show some action shots. Oh the pain…. 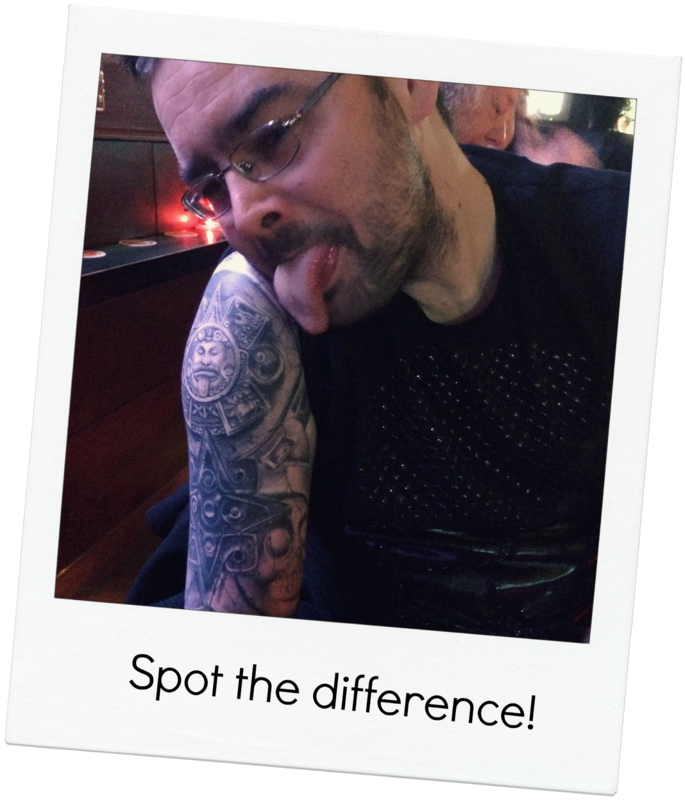 Tattoos are painful – it isn’t roll around on the floor pain, more of a stinging, but boy after a few hours and after my arm had started to swell it felt as though my skin was being ripped from my arm. The outline was done with a single needle, however the shading, and there is a lot of shading was done using a series of needles. The ink was mixed with water and the needles dragged to create shadow effects on my arm. Watching Sonad at work was truly an experience I’ll never forget – it was awe-inspiring to watch such a talented artist enjoy his craft. Breaks for cigarettes were plenty, coffee was on hand and banter was in abundance. I found it fascinating to watch the comings and goings of a studio. All manner of people from all ages came and went, some were tattooed, some pierced and there was always friendly chat to be had. I actually enjoyed my time in the chair despite the pain. 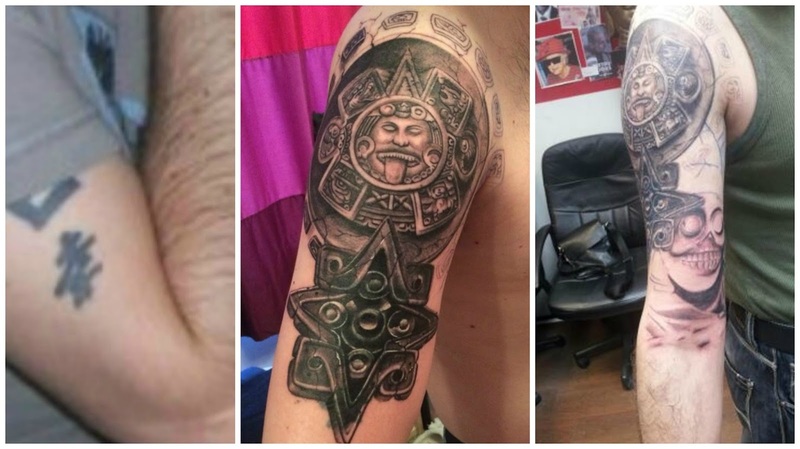 The first sitting included the Mayan calendar and the cover up and I was impressed. The second 4 hour sitting resulted in the first of the faces being inked onto my arm. I didn’t find the second sitting that bad. I’ve attached more photographs – yes my arm is red but it had been through a serious level of trauma. The third sitting didn’t hurt at all, until after I’d walked away from the studio. As the tattoo got closer to my armpit and the inside of my arm the pain was horrific. It genuinely felt like I’d been skinned for a few hours after. The pain subsided though. After sitting in the chair for over 12 hours it was an interesting experience to see how the studio worked. The owner was brutally honest with those wanting to get tattooed or pierced, even if it resulted in lost business. Sound advice was dispensed to those who when just passing that popped on a spur of the moment. At one stage I saw him recommend medical intervention for a young girl wanting to have a stud removed from her finger. She was desperate to have it removed no matter what but he stood by his guns, it wasn’t a procedure he could carry out safely – nor indeed could any studio. I have taken a break from the tattoo for a few weeks – mainly to save up for the second section. As it’s difficult to transfer as arm sizes differ Sonad will be drawing the design for my forearm direct on the skin. He’ll do this in pen first obviously but I have no doubt that whatever he draws will be amazing. Aftercare advice was dispensed in the form of a leaflet and a 10 minute chat. I’d heard that Bepanthen baby cream was the best to use. I was advised that yes, it’s good to use, but mainly after a range of colours are used. It makes them more vibrant by all accounts. As my tattoo is grey and black Sonad advised that I use Vaseline and keep it covered with clingfilm. Advice on washing a few hours after to clean off excess ink was given and regular changes were needed to avoid infection. Yes my arm ached for a few days but I think it was well worth it. I love my tattoo and can’t wait to get the entire arm covered. Most of all, I can’t wait to go back to Southgate Ink, they have made the experience and the result so much better than I thought and every time I look down at my arm I smile. If you are looking for sound advice, great artists, a relaxed atmosphere and a tattoo that will have you beaming you should head down to Southgate Ink. The studio is located just behind Southgate Underground Station on the Piccadilly Line. You can see the inside of the studio, my design on the wall and shots of their sketches and tattoos by visiting the video here at Youtube and their page here on Facebook. In the hours since finishing this post I've learnt that Sonad has left, however I'll be staying with Southgate Ink and passing my arm over to one of the two other talented tattooists who are still there. I've seen their portfolios and watched them work already - I wouldn't go anywhere else. Relax and try to enjoy the experience. What are your thoughts on tattoo's? Do you have any and if so where? Wow that art work is amazing, they did a really good job at covering the old tattoo as well! My hubby has one which he regrets getting, if only we could go back to our younger selves aye? He's always on about getting it recovered but has no idea what to get! I'll show him this post for inspiration. Great read! 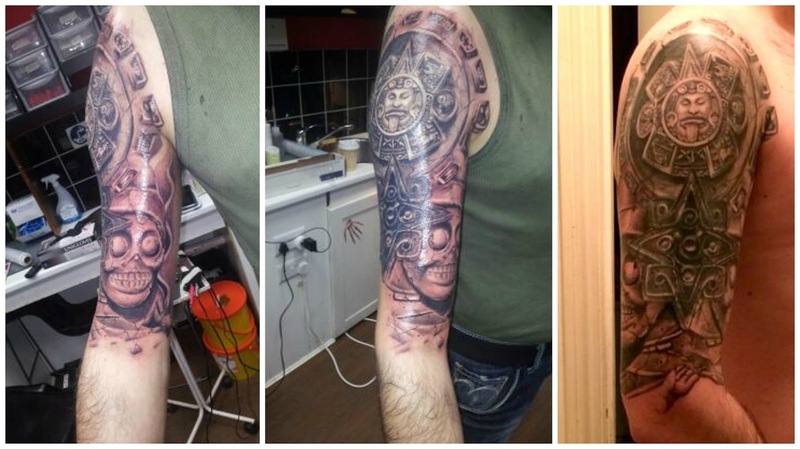 What an amazing cover up, and you're right, Sonad looks like a very talented artist. My first tattoo was very silly, I went to the cheapest, most inexperienced 'tattooist' (NOT) ever. I have lumpy scarred Greek wording that probably means nothing, and is in a daft position. I wouldn't ever cover it up though I don't think. I quite like it even if it is a bit crap!